Although it looks unsightly, Black Spot on Roses can easily be prevented if you take few basic precautions. Good watering and planting methods are number one. Cleanliness in the garden by cleaning up and removing any clippings is second. And of course you can look for ‘Black Spot Resistent’ roses if you happen to live in humid areas where the problem is most pronounced. 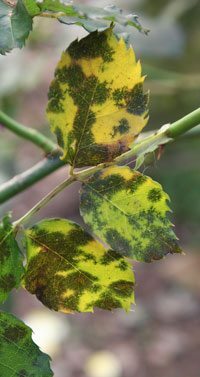 ‘Black spot’ is a fungal disease that causes purple or black spots on the foliage of roses, (picture right) the foliage then to turn yellow and drops off. So thats the severe case, in milder cases only some foliage will be affected, and this will depend on the climate, and the type of rose, some roses are more resistant to black spot than others. Its a fungus (Diplocarpon rosae) that thieves it wet humid conditions but can also affect roses in cooler areas. How do we prevent it ? Good air circulation, never water the foliage, remove all diseased foliage and wood and burn it. When pruning remove all diseased wood in winter. Lots of fungicides are available, in spray form. Some larger rose growers spray with lime sulphate in winter and then use Triforine (a systemic fungus control) in spring, lots of other sprays are available and all do a similar job, however we suggest using a different treatment or spray each year and the fungus is very adaptable and will become resistant to an extent. What about Black Spot resistant roses ? Yes they do exist and to a certain extent are a great alternative, especially in warmer climates, however the fungus, as mentioned does tend to adapt, so be aware? Can you prevent Black Spot? The best prevention is to provide roses a sunny position, do not plant to close together to improve air flow and remove any diseased material and dispose of it.